Sitting in the National Museum of Iraq is a earthenware jar called Baghdad Battery, about the size of a man’s fist. Its existence could require history books throughout the world to be rewritten. According to most texts the “voltic pile,” or electric battery, was invented in 1800 by the Count Alassandro Volta. Volta had observed that when two dissimilar metal probes were placed against frog tissue, a weak electric current was generated. Volta discovered he could reproduce this current outside of living tissue by placing the metals in certain chemical solutions. For this, and his other work with electricity, we commemorate his name in the measurement of electric potential called the volt. The little jar in Baghdad suggests that Volta didn’t invent the battery, but reinvented it. The jar was first described by German archaeologist Wilhelm Konig in 1938. It is unclear if Konig dug the object up himself or located it within the holdings of the museum, but it is known that it was found, with several others, at a place called Khujut Rabu, just outside Baghdad. The jars are believed to be about 2,000 years old and consist of an earthenware shell, with a stopper composed of asphalt. Sticking through the top of the stopper is an iron rod. Inside the jar the rod is surrounded by a cylinder of copper. Konig thought these things looked like electric batteries and published a paper on the subject in 1940. World War II prevented immediate follow-up on the jars, but after hostilities ceased, an American, Willard F. M. Gray of the General Electric High Voltage Laboratory in Pittsfield, Massachusetts, built some reproductions. 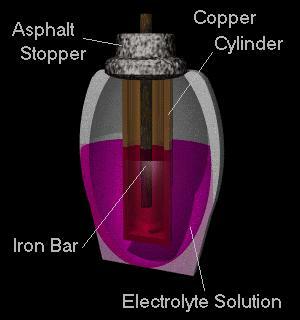 When filled with an electrolyte like grape juice, the devices produced about two volts. Not all scientists accept the “electric battery” description for the jars. Some suggest that they were simply containers used to hold papyrus scrolls. The scrolls have since rotted away leaving just the jars. If they were batteries, though, who made them and what were they used for?